Da Vinci® robotic prostatectomy is a robot-assisted surgical procedure used to safely remove a cancerous prostate. This state of the art technology makes it possible to perform prostate surgery in a minimally invasive way that leaves much less scarring and affords a much shorter recovery period. The da Vinci ® system is so effective; the National Cancer Institute reports that it is now being used in 4 out of 5 radical prostatectomy procedures in the U.S. On average, patients who undergo a radical prostatectomy using the da Vinci ® system have a lower risk of post-surgical complications and experience a faster return of urinary continence. Not to mention, da Vinci ® robotic prostatectomies are more precise when removing cancerous tissues. that prostate cancer affects more than half of all men over the age of 80? The disease is especially common men over the age of 65, although it may be diagnosed in younger men too. Fortunately, prostate cancer is found in its earliest stages 9 out of 10 times, making it easier for urologists to treat the cancer and prevent it from spreading. Am I a candidate for a robotic prostatectomy? You may be a candidate for da Vinci ® robotic prostatectomy if your urologist has recommended surgical treatment for your prostate cancer. 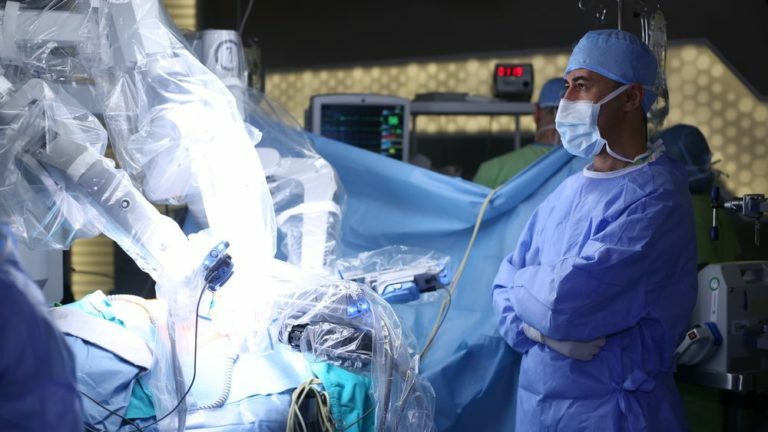 Many patients and doctors prefer robot-assisted surgery over traditional surgery it is arguably both the most effective and least invasive surgical option for prostate removal today. However, only you and your doctor can determine whether da Vinci ® surgery is right for you. What should I expect during a robotic prostatectomy? You will be fully sedated for the duration of your surgery. The da Vinci ® robotic surgery system works using several very small abdominal incisions through which your surgeon will operate. Da Vinci includes high definition imaging that provides your doctor with an in-depth view of the surgical site throughout the procedure. Your doctor remains in total control of the procedure, tough da Vinci ® is designed to eliminate human error and minor hand movements. Will I need to stay in the hospital after my surgery? You will need to spend some time in the hospital following your procedure, but it should be short in comparison to the time you would spend after undergoing traditional prostatectomy surgery. Most patients go home in approximately 24 hours following surgery. You can expect to leave the hospital with a urinary catheter, which will need to remain in place until you no longer require urinary function assistance. Your doctor will provide instructions for post-operative care at home, as well as directions for taking any medications you are prescribed after surgery.